It was Wright’s residence in the industrial heart of England that from his early years had given him a good chance to visit various workshops and to see craftsmen at work. He was obviously fascinated by strong muscular workers and gloomy interiors dramatically illuminated by glowing sparks and white-hot metal. In his industrial paintings Wright continued to experiment with the effects of natural and artificial light which strongly occupied his mind. 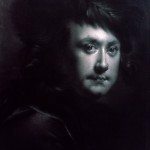 Wright was not the first artist in European art deeply interested in chiaroscuro. His works clearly correspond to paintings by Caravaggio (1569-1609) and his followers, particularly with these by Georges de la Tour (1593-1652). 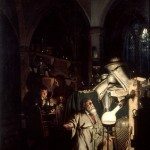 Although Wright probably did not know these pictures or even the name of de la Tour, they have common features and artistic technique. 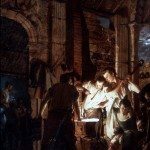 Almost all de la Tour’s paintings are illuminated by the light of a torch or a candle, either flaring nakedly, or covered by a hand. 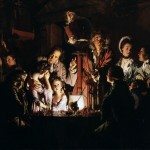 Wright’s term ‘candlelight pictures’ can literally be applied to de la Tour’s works. 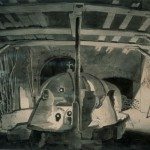 Wright’s series of five pictures of blacksmith’s shops and iron forges painted between 1771 and 1773 is as unusual and original, as his scientific masterpieces. The composition and light effects of the two paintings of blacksmith’s shops are described in his account book. The artist refers to them as ‘Night Pieces’, emphasising their romantic elements. ‘The Blacksmith’s Shop’ shows a dramatic moment when the smiths are striking the iron. 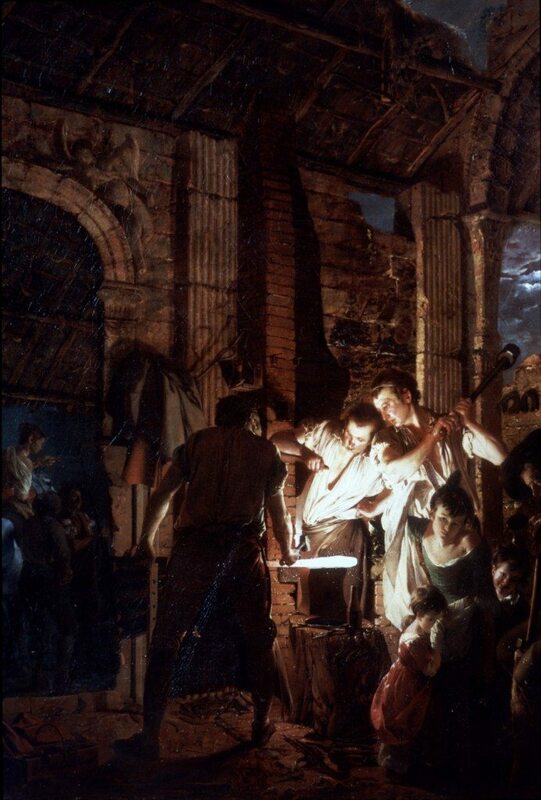 Although the subject is relatively traditional and the smiths’ action is realistic, they are working by moon light, not in an actual workshop but in a semi- ruined classical building. The figures are grouped around a piece of white-hot metal which is the central light source. 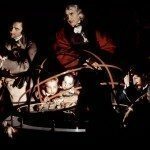 In semi-darkness the figures of an old pensive man and a woman with two children can be seen. It is a representation not of a metal-working process, but rather of a magical atmosphere and the fascination of the natural and industrial world. In many ways the painting echoes 16th century nativity scenes, but at the same time it also anticipates the dramatic images of the Age of Romanticism. When exhibited, these works attracted public attention, and were highly praised by contemporaries. The artist James Northcote referred to Wright as ‘the most famous painter now living for candlelights’. Another painting, “The Iron Forge viewed from Withou” (1773) was bought in 1774 by the Russian Empress, Catherine the Great. This purchase was followed by her acquisition in 1779 of Wright’s Italian works “Firework Display at the Castel Sant’ Angelo in Rome” and “An Eruption of Mount Vesuvius”. In one of the earliest descriptions of sights of St Petersburg (1794) where for the first time the collection of the Empress’ Hermitage was mentioned, its author I G Georgi made a particular note of ‘three pictures and among them the best showing a forge during the dark of night’.